Choose 1 game based on age-appropriateness. Hide treasures (candy, buttons etc) around the room for the kids to find. Variation: Put little treasures in a bag of rice. Kids can put their hands into the bag of rice and rummage for one of the treasures (small toys, cars, marbles etc). The goal of this game is to be the team who collects the most pearls in their bucket. Divide your class into teams. Place an empty bucket for each team at the far end of the room and a bucket full of beads (or marbles, cotton balls, ping pong balls etc) as “pearls” in front of each team. Kids have to take turns to scoop one of the “pearls” from the bucket, and run with it to the other side of the room, where they will drop it in their empty bucket. Whichever team has the most number of “pearls” in their bucket at the end wins. Today we are going to play an old TV game called "The Price Is Right." Have you ever seen it? The contestants on the show are shown an item and then they try to guess how much the item costs. The one who guesses closest to the actual price without going over wins the prize. Bring some items such as Oreo cookies, loaf of bread, bottle of Ribena (you can also show photos of these items with the prices hidden). On the back of the package there is a tag with the price of the cookies. We will see how close you can come to guessing the price without going over the correct price. If you think that the price of this Oreos/item is MORE than RM4.00, raise your hand. No, if you raised your hand, you are out of the game because these cookies do not cost more than RM4.00. If you think the price of this package of cookies is LESS than RM2.00, raise your hand. If you raised your hand, you are out of the game because these cookies cost more than RM2.00. If you think the price of these cookies is MORE than RM3.00, raise your hand. If you raised your hand, you are still in the game. This package of cookies does cost more than RM3.00. Next, I am going to call out a price, If I call out the price that you think is the right price of the cookies, raise your hand. RM3.39 - No, you're out of the game. RM3.49 - No, you're out of the game. RM3.59 - No! You're out! RM3.69 - Yes! These cookies cost $3.69. If your hand is up, you are a winner! You have won the cookies! Parables are stories Jesus told to teach us important lessons about the Kingdom of Heaven. Let’s read these 2 short parables of Jesus. Both the parables have a similar storyline. Both the man and the merchant find something truly valuable to them — some hidden treasure, or a priceless pearl. Both were willing to give up everything they had, to sell all they owned, just to get it. The treasure refers to Israel, God’s first covenant people. They are descendants of Abraham. Since God brought them out of Egypt, they had promised to follow all of God’s laws and commandments, but they always disobeyed. They know God and look forward to His promised Messiah/Saviour. But they rejected Jesus as the Messiah; instead, they crucified Him. But God still loves them. He remembers His covenant with Abraham. That’s why He sent Jesus. Jesus was the man who sold everything He had — He gave his very own life and blood — to pay the price for them … even though they rejected Him. Now all that is left is for them to accept Jesus as their God and Saviour to receive His salvation. Jesus is also the merchant seeking beautiful pearls. What’s a pearl? It is a precious stone formed in a mollusc, like an oyster. When sand or foreign object enters an oyster, it injures the oyster, which continues covering the foreign object with a secretion, called nacre. It keeps on covering and covering until the foreign object becomes a beautiful pearl. Then the oyster dies. The injured (oyster) gives its life to protect and beautify the injurer (foreign object). Much like what Jesus did for us. We, the church, are the pearl — whether we are Jews or Gentiles. Pearls are found deep on the ocean floor. Jesus left the splendours and heights of Heaven to pay the price for us and uncover the church that God intended. (Jesus gave up everything for us, so we can have all He has). God first called the Jews (Israel). And when Jesus came, the invitation to be God’s children is open to the whole world. All of us can accept Jesus, who paid such a great price for us, and be part of God’s family. Jesus is the man/merchant in search for something of great, great value to Him — us. And when He finds us, He was willing to give everything up, just so that He could have us. We are Jesus’ great treasure. We are Jesus’ precious pearl. The world may see us as worthless. But to Jesus, we are so very valuable. You are very valuable. Jesus is also our great treasure and precious pearl. Now that we have Him, let’s hold on to Him — He is more valuable than all the treasures of the world. When we have Jesus, we have everything. Get kids in smaller groups. Get them to share what it means to be so valuable to Jesus that He would give everything for us. Encourage those who have yet to accept Jesus to do so. Prepare some descriptions of occupations, e.g. doctor, teacher, contractor etc. E.g. I help sick people get better. I prescribe medicine. I usually wear a white coat. Who am I? Get the kids to guess the occupation. Hand out small pieces of paper and get each kid to describe him/herself without putting their name. E.g. I am 8 years old. I like to play Pokemon Go. I attend BJJ class after church service. The teacher reads out the description, and the other kids get to guess who the person is. Jesus had been going around performing many miracles. He healed the sick. He fed the thousands. He delivered people from demon possession. Many people had their own ideas about who He was. Was he a prophet like John the Baptist? Or Elijah? Earlier, some people had hoped Jesus would be the one who would overthrow the Roman Empire and be their king. But they all didn’t know who He really was or what He was sent to do. But the Holy Spirit revealed the truth to Peter. Messiah means Saviour. Jesus was sent to the world so that He would suffer all the punishments and the death that we deserved. And He would rise from the dead after three days. And through His death and resurrection, He would save the world from sin and punishment. Jesus is the Messiah of the World. Jesus and His disciples went up to a high mountain. And there, He was transformed into a dazzling white being, together with Elijah and Moses. This is the second time when God spoke these words. The first time was when Jesus had just been baptised and was coming out from the Jordan river. The heavens opened, the dove came down, and God’s voice was heard. In both instances, God wanted to tell those around that Jesus was His beloved Son whom He sent to earth to save the world. Do you know that because of Jesus coming to save the world, you and I can become God’s beloved children? We all may have heard of Jesus or read many things about Him. People outside have their own different opinions about Jesus. Some think He is a myth/fake. Some think He is just a good man. Some say a teacher. Some say a prophet. Some think He is crazy. Do you really know who Jesus is? Let me share with you my Jesus story — how I came to know who Jesus is and who He is to me. Highlight when Jesus became real in your own life and what His salvation means to you. Make sure to keep it age-appropriate. If you would like to accept Jesus into your life as your Saviour/Messiah, pray along with me. Thank you Jesus that You came down to suffer my punishment and die for me. Because of you, I can become a beloved child of God. I want You to be my Messiah. I want to be in God’s family. I receive You into my heart today. Thank you for loving us always. In Your name, I pray Amen. MY JESUS STORY: WHO DO YOU SAY I AM? Prepare some paper and pencils. Get the kids to write out their Jesus Story — Who Jesus is to them, and What He has done for them. Get the kids to share their story with each other. Close in prayer. CRAFT: WHO DO YOU SAY I AM? Related craft with the words “Jesus is the Messiah”. 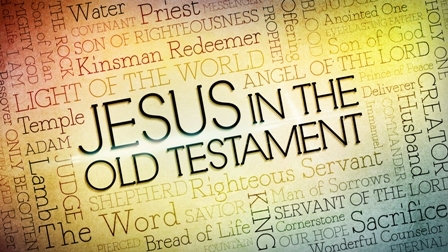 A 6-week series on Jesus in the Old Testament.